Associated Press Colts head coach Frank Reich has embraced analytics and used it throughout his first season. Some of the decisions have backfired, but his players support his go-for-the-win strategy. 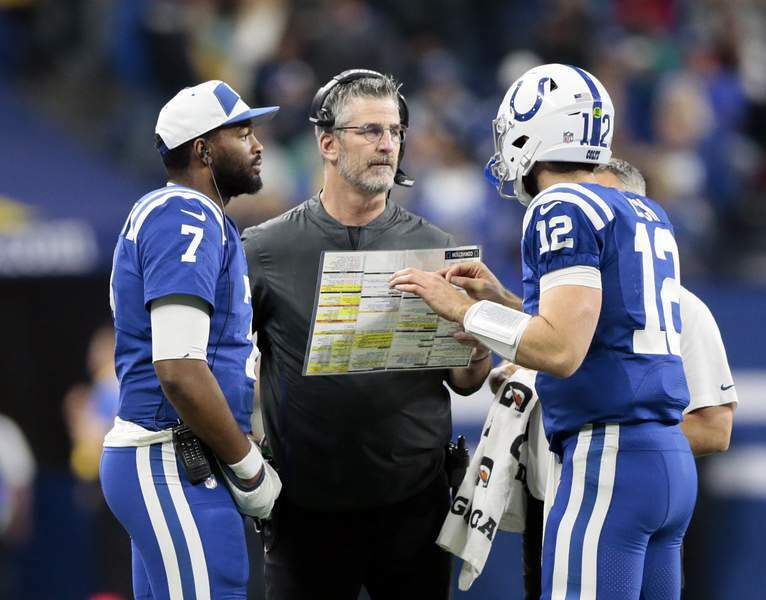 INDIANAPOLIS – Indianapolis Colts coach Frank Reich leaves nothing to chance. He and his staff spend hours meticulously poring through game tapes, crunching numbers and plotting strategy each week. There's a meeting every Friday with the team's two analytics experts where everything from over-under projections to weather conditions come into play. Together, they try to plot out every conceivable game situation in hopes of simplifying the split-second decisions Reich makes each weekend. “They factor what's the expected point total of the game, what's the output of the other offense,” Reich said, explaining some variables used to create the charts. Reich isn't the only NFL coach to use analytics, but he might rely more heavily on the projections than other coaches – regardless of the results. Three times last weekend the Colts (6-6) found themselves facing fourth downs in field-goal position with Adam Vinatieri, the league's career scoring leader, ready to kick. Three times, the charts indicated Reich should go for it. All three times, Indianapolis came up short. The resulting 6-0 loss at Jacksonville ended the Colts' five-game winning streak, complicated their path to the playoffs and dealt Andrew Luck his first shutout as a pro. On Sept. 30, he also opted to go for the win in overtime against Houston. A failed fourth-down attempt allowed the Texans (9-3) to kick the winning field goal as time expired – giving them their first victory in a nine-game winning streak they'll put on the line in Sunday's rematch. Indianapolis (6-6), meanwhile, lost two more games before rebounding with a five-game winning streak that put it back in the playoff mix and had some outsiders openly questioning whether the Colts would have been better off playing it by the book and going for the tie in the first Houston game. Players embrace Reich's aggressive philosophy in large part because they understand the rationale for his decisions, and they know the former NFL quarterback does his homework. He asks the analytics specialists not just to contemplate the Colts' potential game-day situations but also to break down tape of every other NFL game and plot how the Colts would handle those decisions. Then Reich and Luck discuss the charts to assure everyone works from the same playbook. As a self-described nerd who runs his own book club, Luck understands what Reich's philosophy is all about. Reich understands, even acknowledges, that sometimes coaches need to play a hunch or rely on their gut instinct. He's done it, too.